Feb 12--Mrs. Jan Williamson Wood, age 73, of the Marvin Community, died Sunday, February 10, 2019, in Piedmont Atlanta, after an extended illness. She was a native of Vidalia, was a 1964 graduate of Toombs Central High School, and attended Brewton-Parker College. She moved to Smyrna, Georgia in 1968, and lived there until returning to Toombs County in 1996. She was a homemaker, a founding member of the Marvin Yancey Volunteer Fire Department, and was a member of the Providence Baptist Church. She was preceded in death by her husband, Billy L. Wood; granddaughter, Lillie Bell Evans; parents, Hermon and Juanita Pollette Williamson; and a brother, Larry Williamson. Mrs. Williamson is survived by four children, Tammy Dotson Elliott and husband Troy of Ball Ground, Georgia, Traci Dotson Evans and husband Kenneth of Marvin, Todd Wood and wife Heather of Russellville, Arkansas, and Cameron Wood of Marvin; her step-mother, Tycile Williamson of Marvin; four step-sisters, June Taylor and husband Johnny of Statesboro, Gwen Richardson of Dublin, Dale Newsome of Colorado, and Sue Clark of Cobbtown; two step-brothers, Freddie Clark and wife Kathy of Marvin, and Larry Clark of Ailey; nine grandchildren, two great-grandchildren, several nieces and nephews, including two nephews, John Williamson and Glenn Williamson. The funeral service will be held Thursday, February 14th at 3:00 p.m. in the chapel of Ronald V. Hall Funeral Home with Wayne Kirkley officiating. Burial will follow in the Williamson Cemetery in Montgomery County. The family will receive friends at the funeral home on Wednesday evening from 6:00 until 8:00. 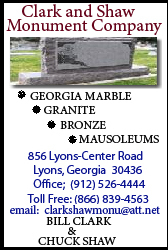 Those desiring make memorial contributions to the Marvin Yancey Volunteer Fire Department, 427 Laura Dixon Road, Lyons GA 30436.